The Pub Crawl turns 18 – old enough to see a Tarantino film legally if it should so desire. Every year, on the 29th December* between Christmas and New Year I run a pub crawl in a geographical location and this year it is time to follow the old dame of the presses, Fleet Street. The hot metal may have now cooled, but there are still tales to tell… And of course pubs of architectural interest. Truth be told there are twice as many pubs on this route, so if any are closed (a pub crawl tradition) we will have somewhere to go. Most of these pubs do food of varying quality. 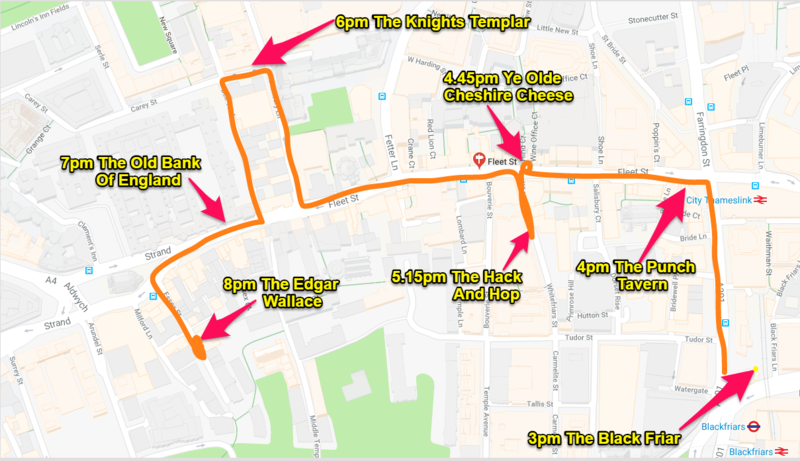 There are other pubs on route in case the usual happens (one is shut) or you want to mark up your crawl card (there is a good chance of a side card here). Come along, bring your friends. Pub crawls only turn 18 once.